Banking in Scotland has a long and distinguished history - to this day Scotland is served by its own banks which form a distinct regional group within the wider British banking system. 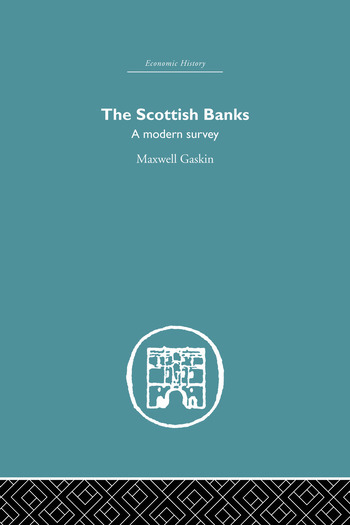 Yet, until this volume, there had been no book which gives a full account of modern Scottish banking, analyzing its position within the British banking structure. With this comprehensive study, this gap in the literature of modern British financial institutions has now been filled. Here, all aspects of Scottish banking are covered. The author describes the structure of the system and the pattern of branch banking, examining the position and practices of Scottish banks in regard to deposits and asset holding. He sets out the modern position of Scottish bank note issues and analyzes their significance both for the banks themselves and for the British system as a whole. The book gives valuable appraisal of the performance of the Scottish banks as lenders to the private business sector. The author is not concerned with Scottish banks simply as institutions domestic to Scotland. He traces their relationship with the City of London and fully analyzes their role within the operations of wider British Monetary policy. This fascinating study, first published in 1965, concludes with a consideration of the future prospects of the Scottish banks within British banking as a whole.